Pre-sessional students arriving at their accommodation. If you are a pre-sessional C student you can move in to your accommodation from 7 July 2018. If you are a pre-sessional D student you can move in to your accommodation from 7 August 2018. If you plan to arrive before these dates, email the Accommodation Team to see if you can move in early. If you plan to arrive outside of the hours 10am to 6pm, email the Accommodation Team to let us know. When you arrive, call our Security team when you arrive on 01225 385349 who can help you. Once you arrive in Bath, you can travel to campus by bus or taxi. If you arrive by coach, you will be dropped off in East Car Park. If you are moving into The Quads, go to the East Accommodation Centre, located next to East Car Park. If you are moving into Westwood or Norwood, walk to the West Accommodation Centre. This is a short walk that will be signposted. You will be living in John Wood Court or John Wood Building. When you arrive at Bath Spa railway station or bus station, walk a few minutes to The Virgil Building on Manvers Street to collect your key. Our accommodation team will be waiting to greet you between 10am and 6pm. They will give you your keys, temporary access card and welcome pack. After you collect your library card from the library on 9 July, you must return your temporary access card to the West Accommodation Centre. If you do not return the card you will receive a £25 fine. Our staff will give directions to your accommodation and help you find it if needed. You can also buy items like rice cookers, bed linen and towels. 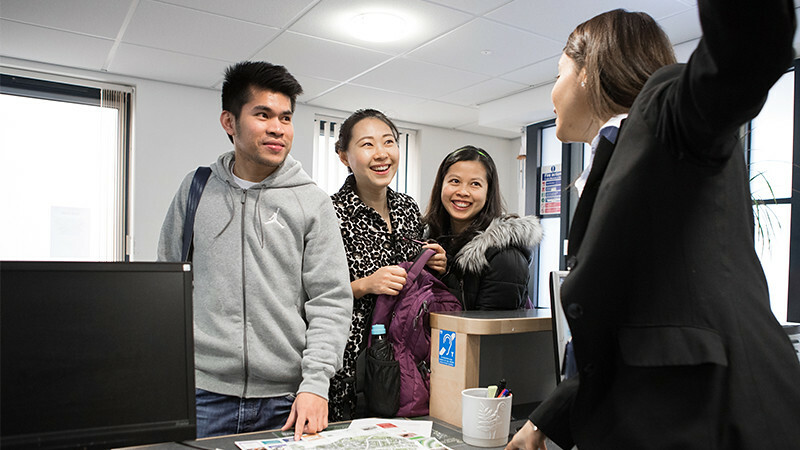 Once you have settled into your new accommodation, you need to attend your induction sessions. This is a compulsory session held in the first few days after you arrive, part of your pre-sessional induction timetable. There are talks held in your kitchen from our accommodation team. It’s important to attend these as they are specific to your accommodation. You’ll hear what do whilst living here and how to stay safe. The times for your talk are advertised on your kitchen noticeboard. If you want to swap bedrooms with another student, you must contact the Student Accommodation team who can tell you if this is possible. You must not swap rooms without telling us you are doing so. One visitor can stay in your accommodation for a maximum of three nights. To arrange this, email accommodation@bath.ac.uk with name of your guest and the dates of their stay. If you have more than one visitor or they would like to stay longer, they can book into our guest accommodation, available from June to September.